Terrifying footage has emerged showing the frightening moment a brave police officer shoots down two ISIS terrorists. 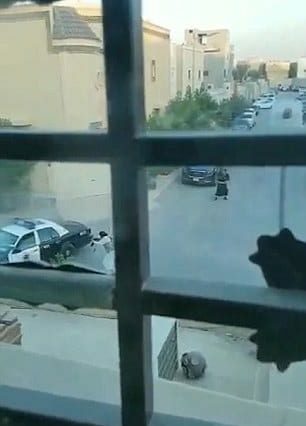 The video filmed from a window by a scared witness in Saudi Arabia, shows the suicide-belt clad extremists running towards a police car. A frightening shootout then broke out between the officer and the two terrorists at dawn in the Jasmine district, in the north of the capital, Riyadh, reports the Daily Mail. Critical information about a potential attack from a gang using explosives was received by security agencies in the city and an early morning raid was planned to counter-act the dangerous threat. However, the extremists did not lie down and take the arrest easily, instead fighting back at the police, shooting at them as they ran towards the car. Horrified citizens watched on from their homes as they watched the dramatic scene pan out and those who were on the street at the time, quickly sought out refuge in a mosque. As well as their suicide belts, the terrorists were armed with machine guns and had taken a hostage with them. The extremists manage to reach the car, but as they do, a brave police officer starts to shoot at them with a pistol – a quarter of the size of their weapons – at point blank range. The terrorists drop down for cover, but the courageous officer shoots them dead. 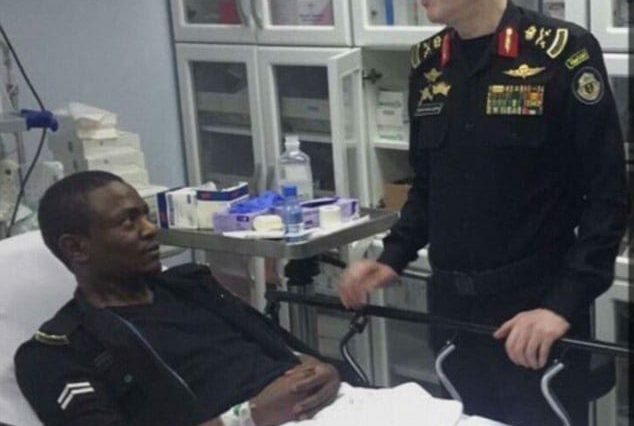 He is currently in hospital being treated for his injuries but he lives to tell his heroic tale. He displayed true bravery in an extremely dangerous and challenging setting, what a hero.